Gorgeous has been very willing to work with and shows three very good basic gaits as well as being brave about jumping. She has progressed very quickly in her training, proving to be an intelligent horse who is very willing to work. She had a foal in 2015 and was then fully started in the winter of 2016 with several breaks due to show season getting too busy but she is now in full training and is jumping courses and even throwing in a few lead changes. She has been off the farm to school and handled everything very well and settled right into work. 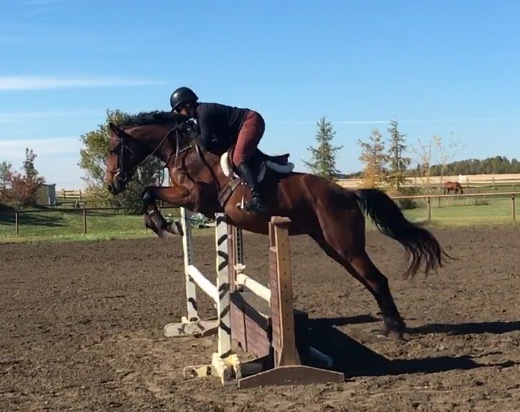 She jumps in perfect form, with an easy to ride bascule, a big step and is naturally very balanced both in the canter and over the fence which would make her an ideal amateur horse as she requires very little work to stay connected. Her sire Talme has proven to be an exceptional sire of amateur friendly hunters and event horses as well as siring several very good dressage horses. Her dam Cencibell has gone on to be a much loved amateur mount who has numerous championships in the hunter ring. Pre sale x-rays on file and available to potential buyers to view. She is currently located on Vancouver Island where she is gaining more show experience.